One, the cost is high. If you have a weekly one hour team meeting, it better have high ROI. The dollar cost of that meeting for a team of five is about $13K per year. A team of ten is $26K per year. (w/ conservative assumption of $100K average salary+benefits+office+etc per team member) That isn't including the opportunity cost and cost of disrupting someone. So reality is likely much higher. However, a great recurring meeting can prevent the need for numerous other mediocre meetings that consume more time, more money, and more opportunity. We were very deliberate with that meeting. We treated the meeting (and the entire process) like an experiment itself, trying new things and making changes based on results as the team grew and evolved. Most meetings get stuck talking about the “what,” - what experiments ran last week or are running this week. This never felt right to me. The what is important to keep people informed and on the same page, but there are more efficient ways to communicate the what. At HubSpot we did this in a couple ways. The first was to keep a public pipeline of experiments that individuals update when they are implementing, running, or analyzing an experiment. If you needed a quick view of what the team is working on you could visit the pipeline. Using, Zapier updates to the experiment pipeline are piped into a Slack room. This keeps the team passively updated of any changes. If individuals need or want more details on the experiment they can easily click on the experiment in the pipeline or Slack update to go to the experiment document. Individuals are encouraged to ask questions and leave comments in the google doc. The result is that team members come to the meeting knowing what is going on. If you don’t focus on the what, then what do you focus on? Instead, focus the meeting about impact and learnings. There are a couple reasons for this. One, unlike the “what,” it is much harder to communicate impact and learnings. As a result, a meeting is the most efficient way to extract those two things. Two, you want the team to get attached to initiatives that will have the most impact. High impact initiatives come from continually learning about your product, channels, and customers and testing ideas against those learnings. The challenge is that most learnings end up living in silos among individuals or teams. If they live in silos, others can’t apply those learnings to their work. If they aren’t applying learnings to their work, they aren’t going to work on the most impactful items. The meeting’s focus is on extracting, discussing, and applying the learnings across the team. 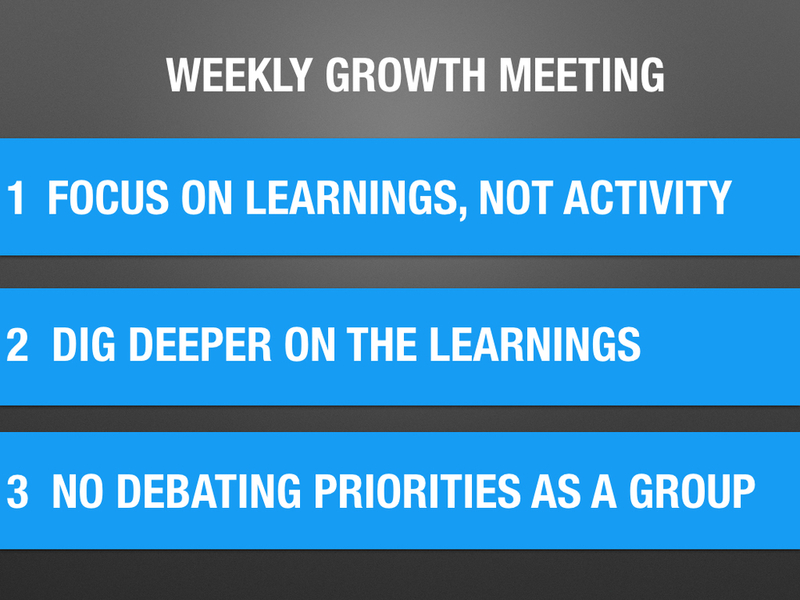 Here is an example set of steps for a weekly meeting occurring on Monday. Friday - Automated email goes out to team with link and reminder to contribute to the weekly meeting document. Friday to Monday - Team contributes their learnings to the doc. Monday Morning - Team reviews experiment pipeline and last weeks metrics to be up to date. Monday Morning - Meeting owner reviews weekly doc before meeting to make any edits needed. 1. Looked at the experiment pipeline so they understand the latest experiments being ran. 2. Looked at our dashboard of key business metrics to understand what the latest numbers are. Prior to the meeting an email is sent to the team with a link to a shared google document. If a team member has a learning, they are expected to input into the document before coming to the meeting. To keep things consistent, everyone uses the same template. At the meeting we run down the list of learnings. The owner of each learning presents the learning as concisely as they can to get it out of their silo and spread it across the team. 1. Is this a valid learning? Questioning validity helps prevent false learnings. Team members ask questions around how they controlled for various factors. 2. What else might this tell us? A lot of times other team members will have different views on data or compelling follow up questions that are worth finding the answers to. Asking this question helps the team dig deeper and extract more out of a learning. 3. How can we apply this learning? As a group try to think about where else on the team or within the product you can apply a learning. This amplifies the impact of the learning. For example, some landing page tests may yield a learning that a specific style/tone/theme of copy produced higher conversions. That probably means you should test the same style in other places like our user invite pages, on boarding process, retention emails, resurrection campaigns, etc, etc. The goal of these three question areas is to raise our game and extract the most that we can out of each learning. Besides focusing on the “what", there are a few other traps that require effort to avoid. Don’t let the conversation veer to debating priorities of experiments. That is never done best in real time in a larger group. Everything should be prioritized based on Probability, Expected Impact, and Resources Required. Priorities should be debated amongst the appropriate team members outside of this meeting after those three things have been evaluated. A lot of times people end up being wrong or incomplete on their analysis and learnings. Exposing this is a huge purpose of this meeting. You need to balance encouraging people to be thorough with out discouraging people when they are wrong. If team members end up being afraid to be wrong, they will be hesitant to present learnings which is the worst possible outcome. Individuals get super excited about their learnings and results. Thats awesome, but sometimes the excitement leads to people giving way too much detail. Conciseness should be part of a good learning. The meeting is typically 45 min on average. They should never be longer than an hour. There are a few other tips that have helped us make this meeting effective. Make sure there is an owner for the meeting. That owner should send out any reminder/prep emails and info every week. More importantly they are responsible for facilitating questions in the meeting, moderating/editing the learnings prior to the meeting, and making sure the meeting doesn’t fall into the above traps. When the HubSpot team was small, I was the owner, as the team grew it was more effective to have Dan Wolchonok, Sr PM, take over. Routine’s build habits. This meeting is about building good habits around impact and learning. Do everything you would do if you were to build a routine around something else like waking up early. Set a regular recurring time and try really hard not to change it. Set automated triggers like reminder emails that go out before the meeting to remind people to prep. If someone is distracting or not contributing in the way that you want them to, give them 1 on 1 feedback as quickly as you can. The longer you let bad behaviors go, the more others will pick up those bad behaviors, and the harder it is to get things on track. Learnings that are particularly impactful should be celebrated among the team almost as a milestone. Just as you want to discourage bad behaviors, encourage the behaviors that you want. Your team will hit a size where going through every learning for the entire team becomes unwieldy. You also end up with learnings that are super specific to a sub-team. For example, a learning behind Facebook’s ad algorithm is probably important to your paid acquisition team, but not everyone else. At that point, each individual team within growth should have their own meeting. Likely 30 minutes. Then the entire team comes together for an additional 15min - 30min and the most important/relevant learnings are presented.